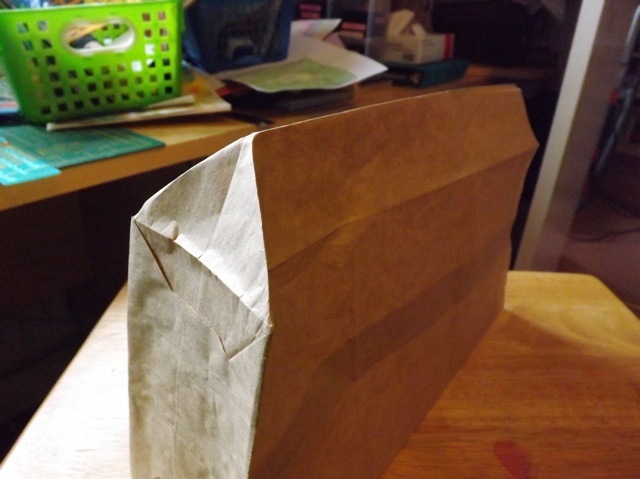 My book uses 4 standard lunch bags. That’s not to say that you can’t use the smaller nice ones (I think they are called Celebration bags, from Michaels in the USA) but that is not what I used. The standard bags can be ever so slightly wonky, but that is part of their charm for me. 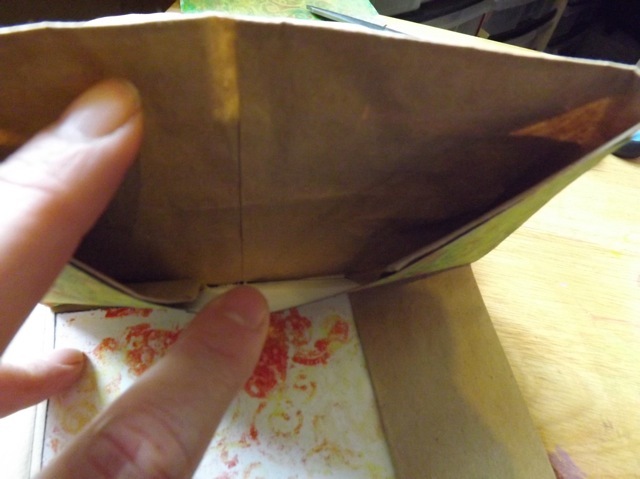 Fold the bottom flap over onto the body of the bag, over the folded in side gussets. 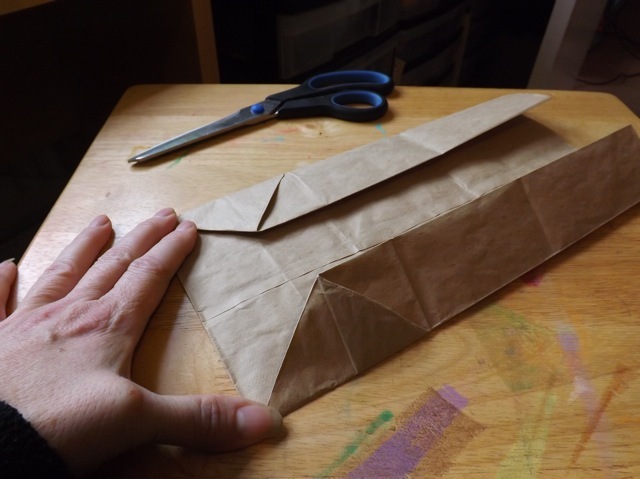 You might like to reinforce all the folds at this point, with a bone folder or the back of a spoon or just your thumbnail, so the creases are as crisp as you can make them. 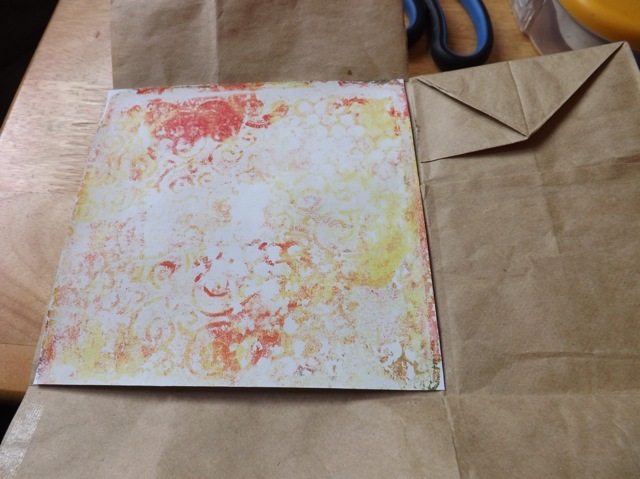 Because I am using the Gelli prints from the 6 x 6 plate, I trimmed the bags so the area from the fold to the edge of the opening is 6 inches. If you want a bigger book, don’t cut! OK, now we will switch to diagrams, so I can explain the cutting more easily. 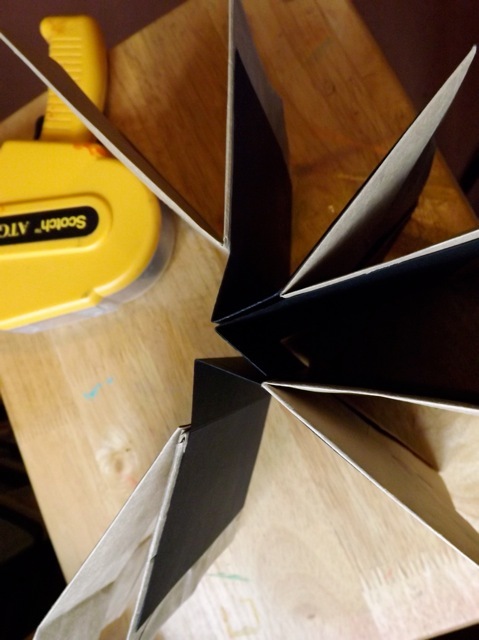 You will make TWO sets of TWO bags. At this point the long flaps, top and bottom need to be stuck together from inside the bag, making those flaps a more cohesive whole. 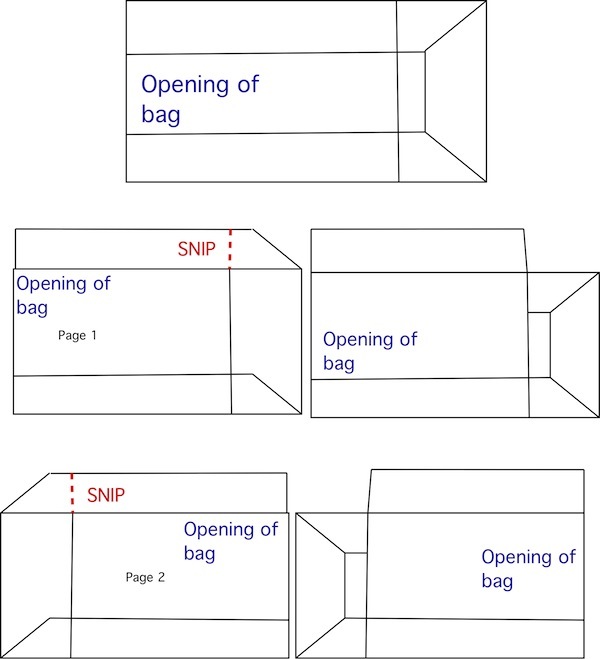 Just open the bag and stick JUST the area from the top to the snip (the area the scissor tip is “pointing to” above) and the same area on the bottom, but to the fold, as you have not snipped it, have you? 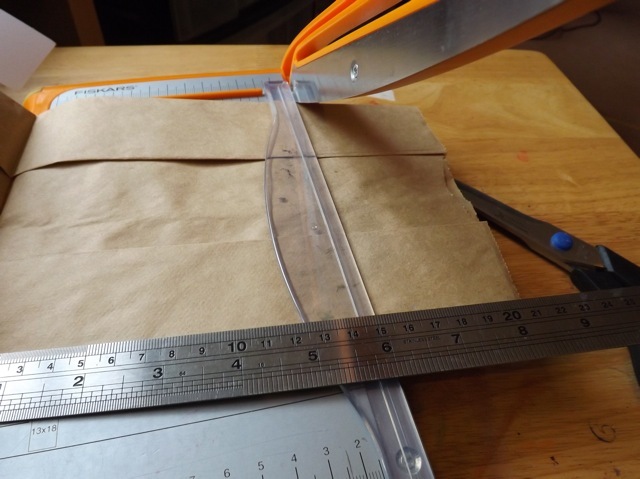 While the bag is still open and unstuck, cut yourself a little template for the side pockets. 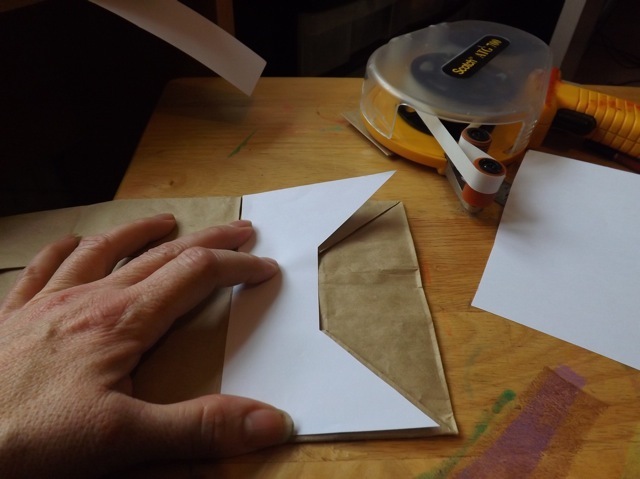 This is where the wonkiness comes in to play – unless you really want to cut a template for each bag pocket, the one you cut is unlikely to match perfectly for all bags. Live with it or do each one, or make the side pocket a rectangle rather than following the lines of the folds like I did! I used three. 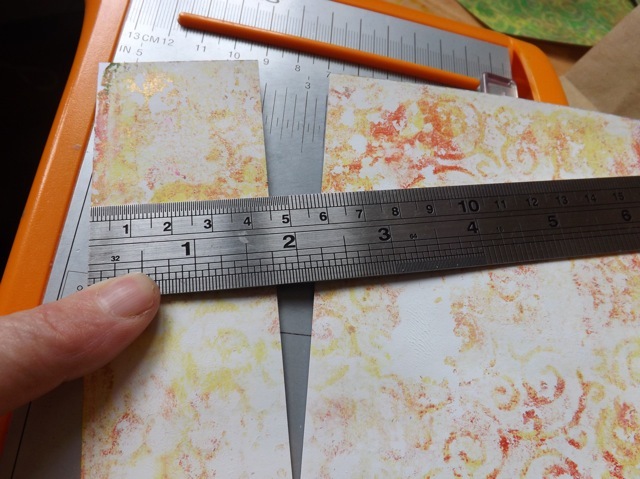 This is a little flexible, but since I am using A4 cardstock, I cut it in half (that’s roughly at 5 3/4 inches) then trimmed it to 8 inches. No real reason for that, it was kinda automatic. In any case it just needs to be smaller than 6 inches tall and the wings need to be narrower than 4 inches (the width of the bag bottom) so don’t get too hung up on exact measurements. If you are using a US letter piece of card 5 1/2 x 8 will be fine. 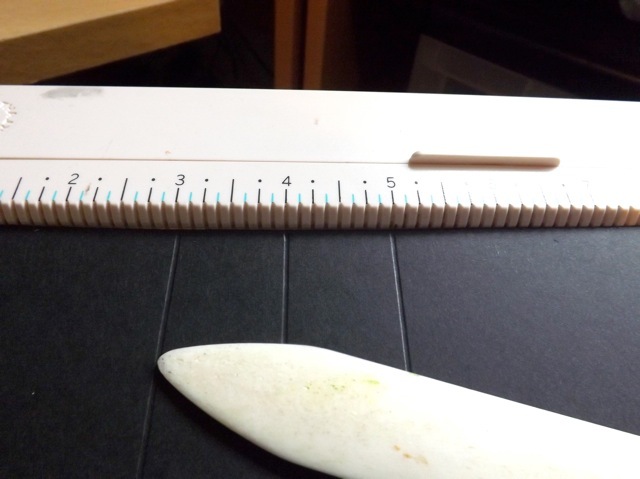 Score each of the three at 3 inches, 4 inches and 5 inches along the longer side. Can you see that the wings are attached, but the little fold in the middle is free, and extends PAST the edges of the bag? Do exactly the same for Bags Three and Four. Now it is up to you – a few possibilities. I chose to stick the spine extensions together. You may not want to. 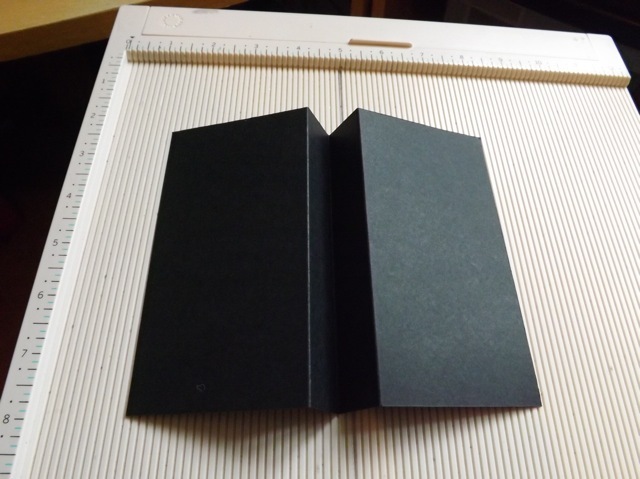 I toyed with covering the spine unit with another Gelli print, but to be honest I liked the black contrast. 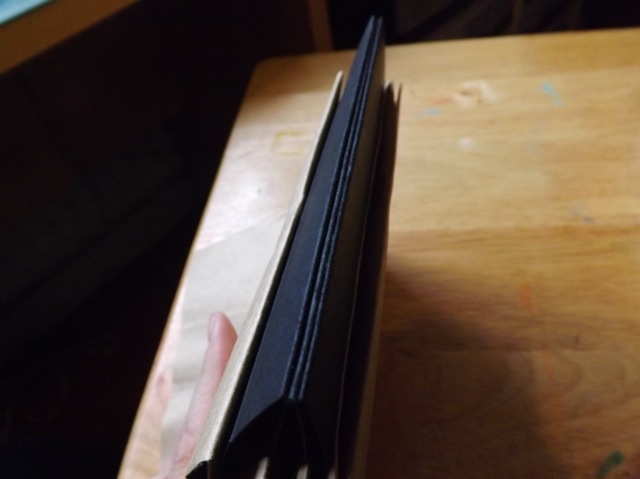 I hope you can see in the shots above and more from yesterday that the spine done this way allows the book to really open up, although I’m not sure you could get loads of really thick, dimensional embellishments in there even so, but I’ve not decorated mine yet. The rest of it is pretty much as you would expect it to be. Stick two prints, back to back, sandwiching the flap at the top. 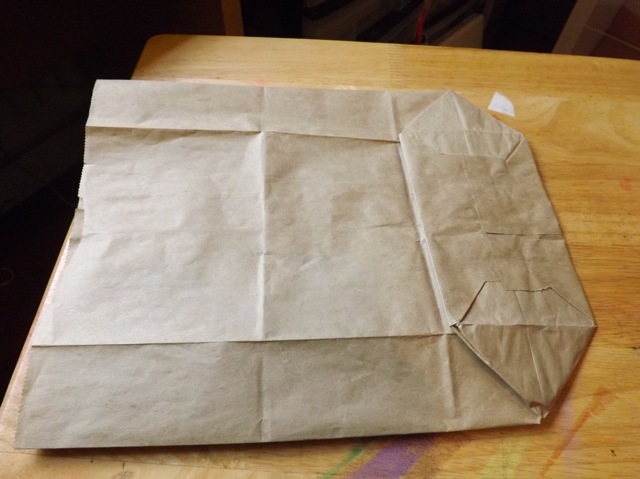 Cover the inside of the side pocket, then fold in and use your template to cut a covering piece. This completes the pocket. 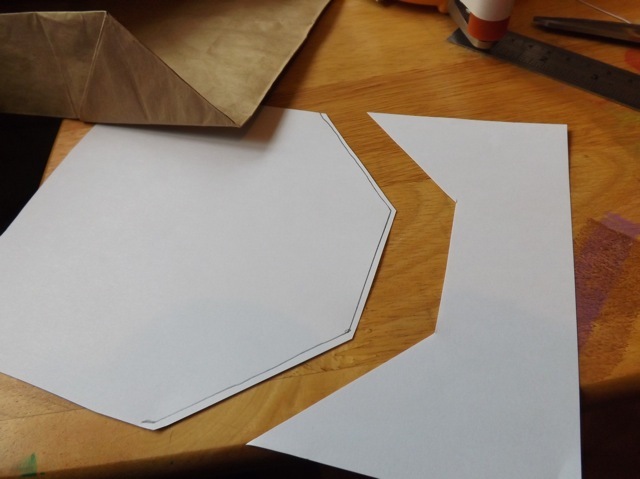 You CAN use TWO of the template pieces, back to back, sandwiching the sides, for a more solid finish. 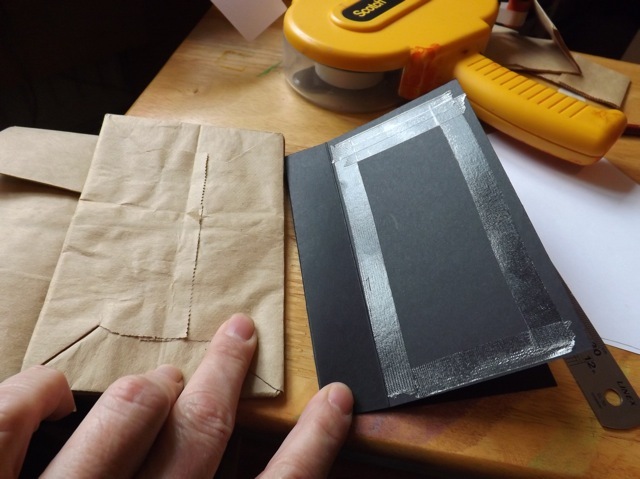 Decorate behind the bottom flap – I cut off enough to use that strip to cover the front of the pocket on another page and along the pocket. 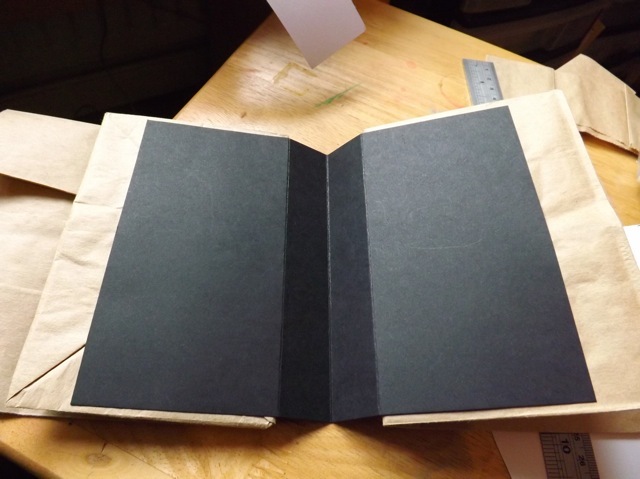 Decorate all the pages to cover the spine wings as already shown. Good lord that is LONG. But I hope it explains it well enough for you to have a go! Added note: Interesting. The Google reader version turns out at 28 pages and more or less puts one photo per page. The Readability version is 17 pages and seems more usable so that is the one I added! 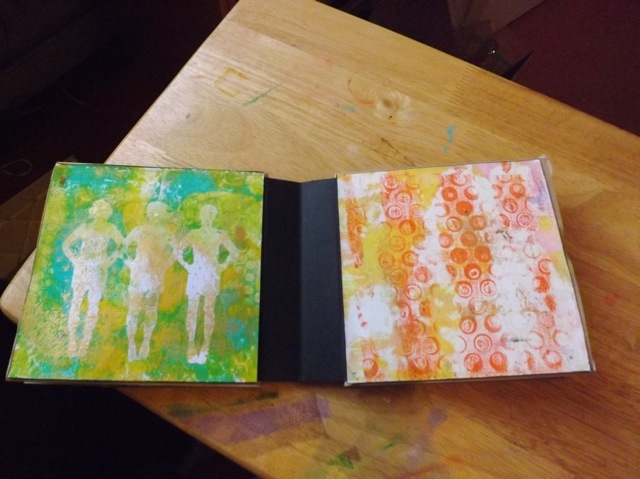 It goes without saying that you can use this basic construction for a standard (non-Gelli print) book and cover with scrapbook papers instead! I hope you like it. It’s been a long time since I’ve done a PBB or a mini and I really enjoyed it. Hope you did too. 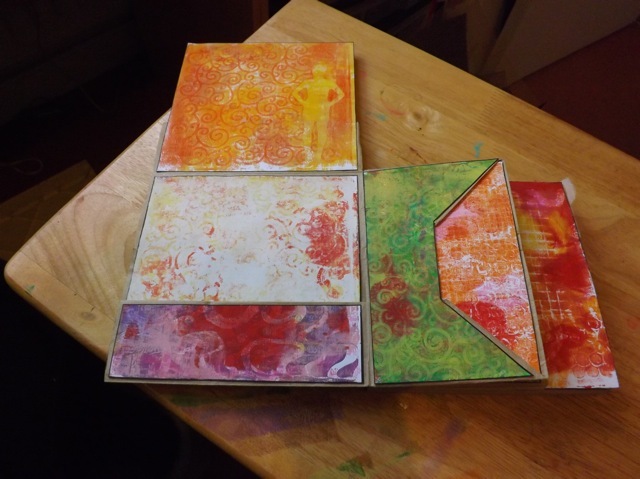 Categories: Gelli plate monoprints, mini-albums, tutorial | Tags: Gelli plate, how-to, mini-albums, paper bag books | Permalink. 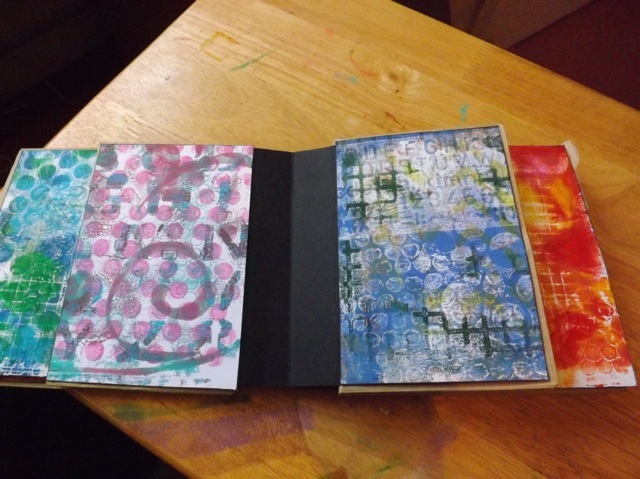 Thank you for trying to explain…II just really enjoyed seeing the pages develop and the gorgeous arty pages you made to showcase in your book. Thank you for the explanation it’s super clear, I can’t wait to try making it. Well, I am totally confuddled, but that is a normal state for me, lol! Your instructions along with the photos are wonderful, I just read thru it too fast, or better said, just skimmed over the written part, looking at the photos instead, lol! I am sure that when I take time to really pay attention to the instructions (having it in .pdf will make it even easier! ), I’ll get it in no time at all! I must say Mary Anne, that you are quite the genius! I’ve seen your YT vids and I should have discovered your blog much, much sooner! Thank you so much for sharing this genius with all of us. I certainly appreciate it, and am sure everyone else does too! 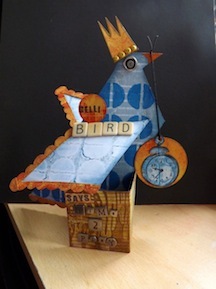 Oh Mary Anne that’s fabulous – I’ve got a paperbag to play with – but the bit I’m stuck with is when you snip at the top – what happens to the bit on the top right? 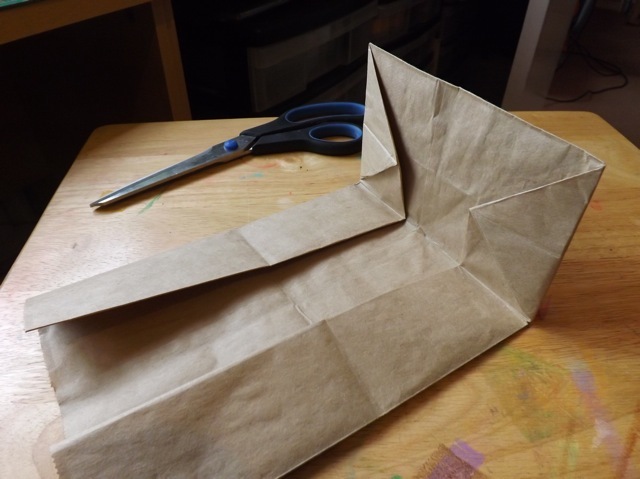 Do you fold it to the front of the bottom of the bag, the back or cut it off? 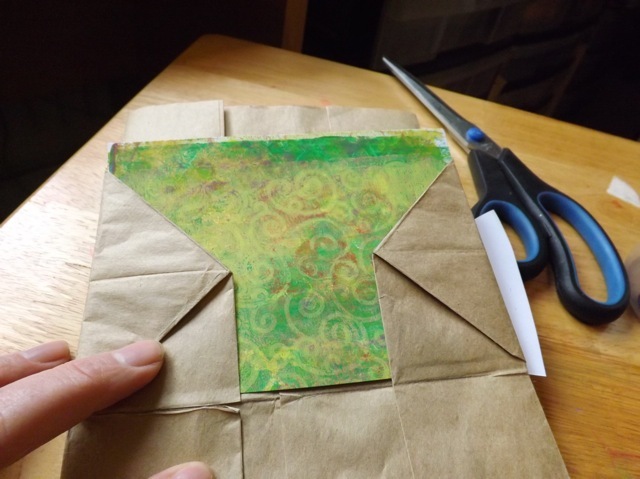 When you snip, you are creating the free-floating flap that will get covered front and back with 6 x 6 (more or less) piece (be they gelli prints or cardstock). 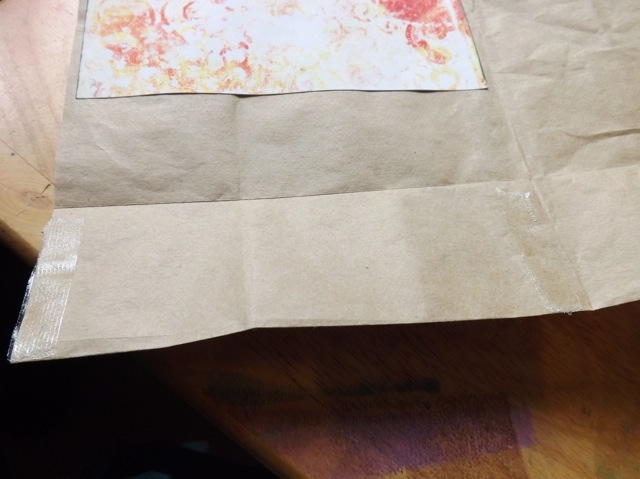 If you are looking at BAG ONE, the bit to the right that you have freed up folds first DOWN onto the 1/2 size page then gets covered with the template piece. The template piece joins with the two little odd shaped flaps to create the side pocket. Look at the photo just BELOW the diagram. I think you are speaking of the small piece at the top right of the bag, just above the scissors in the photo? 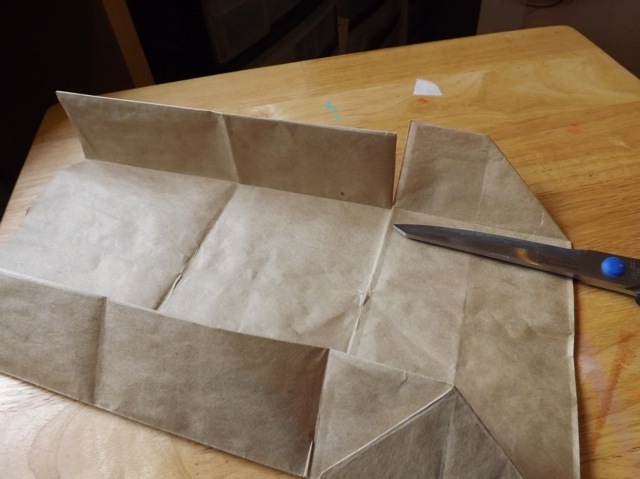 That folds down, to basically where the scissors are in the photo. Yes I got it – thank you! 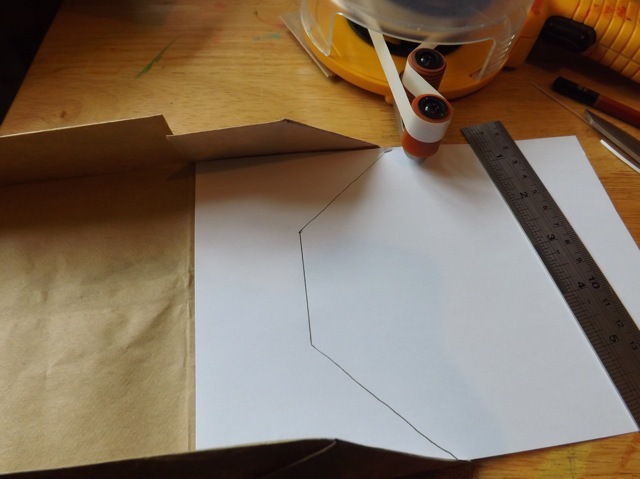 Thank you so much for posting this excellent explanation…I will have a go at doing it asap! 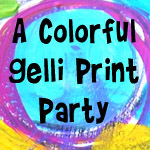 You may possibly be interested to know what I did with my last collection of gelli prints…I cut them out and glued 6 of them with half pva and water onto a 36″ wide piece of cotton organza, then sealed them with acrylic wax. 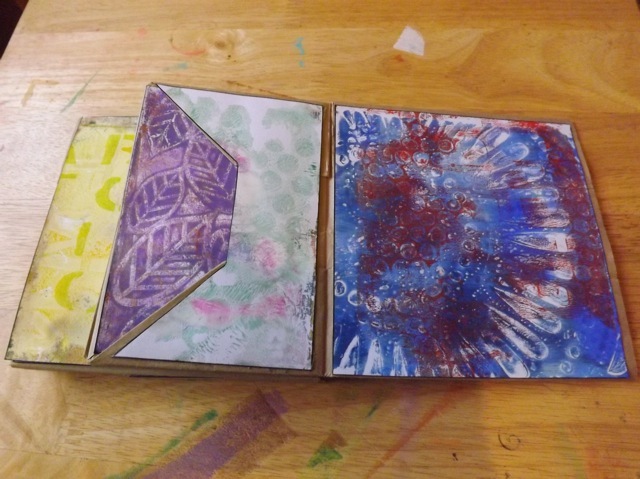 I added two stiffer gelli prints onto the back of the images at each end. Then I stamped on the back of the remaining images. 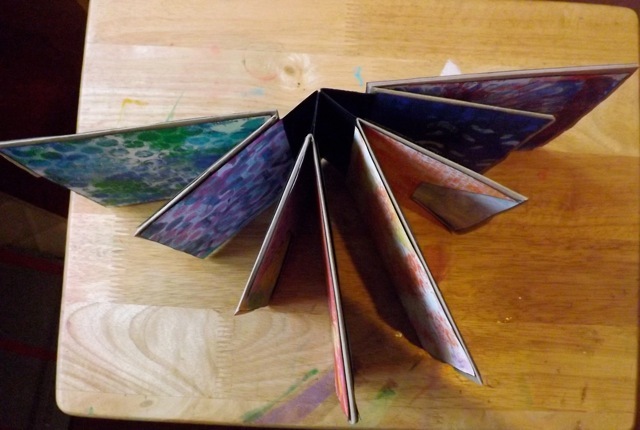 The whole strip was accordion folded into a book..see my website http://www.drusillacole.co.uk…. Your books are lovely, tho’, so glad you linked. And I’ll look forward to seeing your version of my book, so do come back and let me know!